MJ Kaufman (Playwright): Recent productions include Masculinity Max in the Public Theater Studio program, Sensitive Guys at InterAct Theater and A Walrus in the Body of a Crocodile at Clubbed Thumb. MJ’s work has also been produced and developed at WP Theater, Colt Coeur, New Conservatory Theatre Center, NAATCO, New York Theater Workshop, the New Museum, Yale School of Drama and Lark Play Development Center as well as in Russian in Moscow. 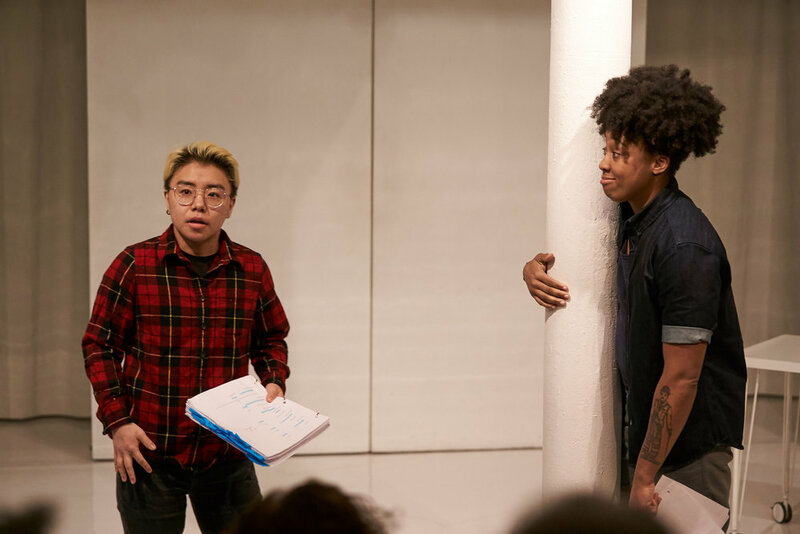 Along with Kit Yan, MJ co-founded Trans Lab, a fellowship for TGNG theater artists. Recently MJ was a staff writer on Netflix’ "The Chilling Adventures of Sabrina." Kara Kaufman*: Playwrights Realm: The Revolving Cycles Truly and Steadily Roll'd, Hello, From the Children of Planet Earth; Sojourners. Selected Off-Broadway: Sojourners and Her Portmanteau (NYTW); Kingdom Come (Roundabout); Today Is My Birthday (P73); Travels With My Aunt; John & Jen (Keen Company); SeaWife (Naked Angels); I See You; The Mysteries; Restoration Comedy; These Seven Sicknesses; Kaspar Hauser (Flea); Dani Girl (EPBB); The Opponent (A Red Orchid); Neva (Public); Really Really (MCC); Lush Valley (HERE Arts Center); Paternity (Cherry Lane) and Hold Music (Living Theatre). Proud AEA member and Harvard grad. Alfie Fuller (Erika)*: Is God Is (Soho Rep. OBIE Award winner, Drama League Distinguished Performance nom), Artney Jackson (Williamstown), Dangerous House (Williamstown. Berkshires Best Actress nom), BLKS (April 2019 at MCC), Red Card Yellow Card (New Ohio), Cowboy Mouth (Labyrinth), Antony & Cleopatra (American Theatre of Actors). Film/TV: “Standing8” (Urban Film Festival winner), “Simoune,” “We Don’t Know What We’re Doing,” “FIEND.” Training: New School for Drama MFA. Nina Hellman (Joan)*: Off Broadway: Pericles (Theatre For A New Audience, Trevor Nunn Director); 10 Out Of 12 (Soho Rep); Great Lakes (New Georges & Women’s Project); Paris Commune (BAM-Civilians); The Internationalist (Vineyard –Lortel Nomination); Trouble in Paradise (Hourglass – Obie Award) Regional: Wooly Mammoth, White Heron, Huntington, South Coast Rep, Geva. Film/TV: “Search Party” (tbs), "Wet Hot American Summer” (Original Film & Netflix, series regular), “Nurse Jackie” (recurring), "Role Models”, "Damages”, "Venture Brothers”, “L&O:CI.” Nina lives in Brooklyn NY with her husband, and their 2 children. Michael Tisdale (Frank)*: Frank earned a BFA from Juilliard and an MFA in Playwriting from the UIOWA Playwrights’ Workshop. During his quarter century as a professional actor he’s worked under such luminaries as Sidney Lumet, Sir Peter Hall, and many more. His plays have been produced in NYC and throughout the U.S.; his short films have been official selections at Sundance IFF, and 30+ other major festivals worldwide; and featured Bill Irwin, Mercedes Ruehl, and Adam Driver. He’s designed sets and costumes, taught at colleges across the country, cast feature films, and currently works as dramaturg and research assistant to Doug Wright. Edgard Toro (Myles / Myles 2): Edgard has a BFA in Multi-Media Performing Arts from Lehman College. In 2016 he competed in the Irene Ryan’s and Performed at the Kennedy Center. In the beginning of 2019, he resides with Intar as one of their members. Some of Edgard’s credits include; Bring it On (Black Spectrum Theater), Passing Strange (Lehman College), Alligator Mouth (Intar), I Am Calling (Cherry Lane Theater), My-My-My Name Is (LPAC). He is grateful for this opportunity to work on Double Atlas with MJ Kaufman & David Mendizábal alongside a Wonderful Cast.